Personality: Clover is very bright and cheery at most times. She is child like in most aspects of her personality, expressing wonder and amazement upon experiencing most things, relishing in small things such as the beauty of the sky or nature itself. Further reflecting her childish nature, she likes to give people nicknames, likes to play many kid-oriented games, and prefers to spend her free time doing many child-oriented activities, such as coloring, watching cartoons, or playing the occasional video game. She also has been shown to enjoy athletic activities, playing many sports at her school when she was younger. She is very loyal, showing great devotion to her family, and to the few friends she had. Perhaps the only time the girl's serious side shows is when she is fighting, or defending others. Her eyes, usually bright and wide in cheer, narrow, and take on a very harsh glare. Her usual smile is replaced by a harsh scowl, and her entire manner changes to a more threatening, more powerful figure. Appearance: Clover stands at 5' 6", putting her slightly on the taller side. She has a very rounded, yet more mature looking face than most her age. Her eyes are a bright green color, and are very large and open. She has a thin nose, and a jaw and mouth of perfect proportion to the rest of her face. She has long black, straight black hair that reaches down to her mid back, and with bangs that are swept to the sides of her face, framing it perfectly. She has a small cowlick near the back on the left side, making her hair stick out ever so slightly. Despite being an android, the hair is organic, and energized by the android body to grow as normal hair would. Like a hair farm on top of the head. Clover's skin is a pale white, just as her "Mother" and "Fathers" were, and her figure is beautiful, slender, yet not lanky, with a C sized bust, and hips and waist measurements that are in perfect proportion. She does have a slightly small torso, with slightly long legs, but that appears to be her only fault in appearances. No scars, not even the slightest blemish on her "skin," and not a hair out of place. Bio: Luse Zhuang was a simple, yet brilliant man. A dual major in engineering and AI programming, he graduated early, and was at the top of his workplace by the age of twenty five. After college, he had taken on a job under the Schnee company's employ, overseeing and developing AI for their security androids. The job paid well for an experienced worker, not to mention a young man right out of college. He had married his teenage sweetheart a year prior, and he had just successfully paid of the last of the student loans. Unfortunate, for the tragedy about to befall him. Three years after this view, we see a sad man. A very, sad man, with a three year old daughter, constantly sick in bed, and without a mother to call her own. She had died in childbirth, and now their girl, Clover Zhuang (named after her mother), was constantly sick, and needed constant attention, if not from her father, than from her aunt, who had moved in to help care for her. The girl was a joy to have though. She was as energetic as she could possibly be at all times, even when her sickness was at her worst. She showed all the love in the world for her father, who couldn't even be around much to see her. She admired the childhood stories told to her, and showed a deep love for the stories of the hunters and huntresses that hunted down grimm and protected them. "I wanna be a huntwess when I grow up Daddy!" she would cry. He began to work through nights on his biggest project ever, keeping it a secret even from his superiors at work who demanded all knowledge of his AI skills. He coded from scratch, every variable and flag, every code and sequence. This would be the most advanced AI the world would see, and yet nobody would know. This would be a human girl to everyone but them two. After a year, the AI was created and functional, and Zhuang began working on a body, a unit to house the girl. After one more year, Zhuang had a functioning little seven year old girl, crafted in the image of his young daughter. The AI that made her up functioned perfectly with the body. She wanted, she learned, and she (seemingly) was able to feel emotion that a little girl should. She could cry, laugh, eat, run, play, and be a child. And Zhuang poured his heart into his daughter, only telling his very close family about her, and lying to everyone else, saying she was human as anything else. He made subtle adjustments every few months to simulate her aging. She went to school as a normal child, being deemed gifted because of "her amazing ability to learn and understand faster than the other children." She was athletic, and she grew into a beautiful "young woman." However, the girl also had directives that she could not ignore. She was built to be a daughter to Dr. Zhuang, and she was his daughter firsthand. She had few friends, because she preffered to stay at her house and await her father, to spend time with him, to talk about problems with him, and nobody else. And, however...she had a second directive. She wanted to be a huntress, it was her dream, and that's the only reason why. She confronted her father about this at the age of fifteen, and, understanding, he began his adjustments in more athletic areas than esthetic, making her steadily stronger, faster, while her appearance stayed that of a thin-built, young looking girl. When it came time for her secondary schooling, Zhuang applied her for any and all of the hunter-training academies, and, maybe through his reputation, maybe through dumb luck, or maybe because of the fact that she seemed SO unfit to be a huntress, Clover got an interview. She was accepted into Beacon academy, and some very quick aesthetic changes were made to her body to make her seem "old for seventeen, but young for twenty." The adjustments would have to last her for the next four years, after all. A weapon was crafted, and The morning the airships came from Vale, a quick, heartfelt goodbye was given, and Clover was off. Battle attire: Clover's most recognizable trademark is a forest long coat with three tails and a flower like pattern on the right side of the jacket. Beneath it, she usually wears either short sleeved shirts, or tank tops, her favorite color being pink, but the color fluctuating between pink, red, and light purple. On her legs, she usually wears a loose black skirt that trails down to just above her ankles, and flows and fans out when moving quite gracefully. It's very loose around the legs and ankles, making for easy movement without a whole lot of exposure, however, in full combat scenarios, she'll opt out of the skirt for a pair of black trousers. On her feet she wears black running shoes because of their ease to move in and good traction, but not for any real style purpose. For this reason, they are plain black, with no logo, and plain black laces. She also wears black long socks of varying length, from Knee length, to mid-calf. Fighting style: Clover fights in the Iaido style, quickly unsheathing the weapon for fast and precise, strong strikes, before re sheathing it. This means that, she usual begins and ends a battle with a single strike, and she picks her moments very carefully. She dodges most oncoming attacks, or if she cannot dodge, blocks them with the end of her sheath. Her weapons unique design makes these strikes all the more deadly. Weapon Description: The Vibrokatana sits in a very ornate sheath, designed with a clip that houses small canisters of dust that provide the force for a function of the sheath that fires the blade out when the trigger is pulled. Depending on the color of dust, a different colored light will come from the sheath as the blade is being released. When in the sheath, the blade locks in place, not letting it be pulled by anybody, not even Clover pull it, unless it is shot. It is fired out at very high speeds, making it difficult to keep hold of once it is released. The blade itself has bee made with Clover in mind. The pommel and hilt of the weapon house the device that make the weapon's blade vibrate at very high speeds, sending vibrations through the weapon that would make it difficult for a human to wield without pain. The blade is very reflective, and even glows very slightly. It is tinted light green, making the glow green, and leaving a light green trail of light when it is swung. The weapon hums slightly because of it's fast vibrations, and, though it is not particularly sharp, these vibrations, plus a small static charge along the blade gives it a good amount of cutting power. The weapon is made for efficiency, and receives charges for these functions when it is sheathed, a small device in the sheath pumping power into the blade and down into a battery that rests into the pommel. 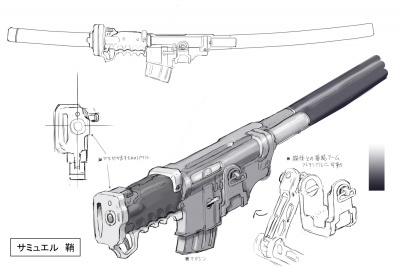 However, the weapon will only charge enough to give it enough power for one minute of continuous use. With a full clip, the weapon can be fully charged and shot from the sheath three times, with six containers of dust resting in the clip. These numbers can very based on the number of times the weapon is sheathed, and how full the canisters are. Firing the blade always uses one canister. Weapon Abilities: The Vibrokatana vibrates at very high speeds, fast enough for it to give off a slight hum, and can also illuminate dark areas very slightly, and when functioning, it has been tested to cut through an inch of solid concrete, a half inch of steel plating, and a fourth of the way into a ten inch tall block of aluminum. Matching blades with this weapon is a bad idea, as it will likely damage the weapon crossing it severely. Strengths and Weaknesses: Clover has no semblance, leaving her with all her cards on the table. She only has her weapons and the physical and mental advantages of being a robot. However, with Semblances so wide and varied, nearly all will take her by surprise, at least the first time. She is also programed to be very sensitive, making her a bit of a "Crybaby." Her ears are a vital point, and cannot have liquid get into them, as there is no way for the liquid to reach the reservoirs in the body, and there is massive risk that liquid in the ears could short her out. Cobalt also cannot swim, as she will sink like a rock. Despite being made up of VERY compact machinery, Cobalt only weighs about 150lbs, light for an android, but heavy for a girl of her size. Her body also functions on a tight schedule. She can stay active for nineteen hours maximum, before she has to, and WILL "sleep." I worry that the vibration aspect of the blade may be a little overpowered in and of itself. Otherwise, I see no real issue.